First, some environmental history of Succotash Marsh, RI. 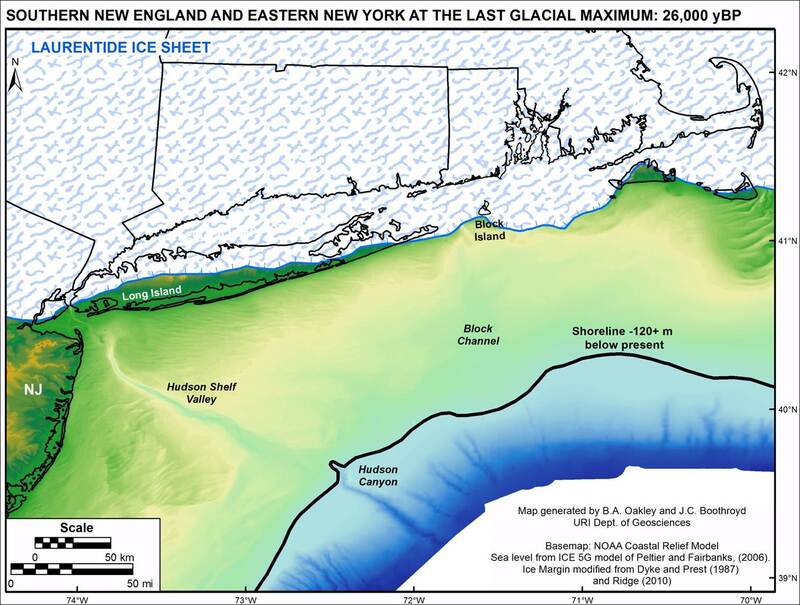 Reconstruction of the Laurentide Ice Sheet in southern New England: 26,000 years before present. Map by Bryan Oakley. Around 26,000-21,000 years ago, during the last ice age, Rhode Island was covered by a few hundred meter thick glacial ice sheet called the Laurentide Ice Sheet. Block Island was the edge of the ice sheet but as the Earth warmed, the sheet melted, retreated and stalled around the southern coast of Rhode Island. The power of the glacier was responsible for moving sediment in the form of rocks, boulders, and soil around this area. The sediment that was carried by the glacier as it moved forward was now left by the glacier as it retreated. That sediment now became the source for Rhode Island beaches. States like New Jersey that were not under the glacial ice sheet have fewer reserves, since there was no glacier to move sediment there, to replenish their beach and must resort to dredging and beach replenishment. Aside from glacier movement, sediment can also be transported along the coast by something called the longshore current. For Rhode Island, the dominating summer winds from the southwest blow over the ocean creating the longshore current. The current is responsible for moving sand in the same direction along the coast. Longshore sediment transport can close off salt marshes from the open ocean and is one way barrier islands can be formed. Once the land is closed off, a lagoon, or coastal pond, is formed opposite of a barrier island. When a large storm hits or the ponds flood, the inlets open and the ponds can flush. In natural areas, storms are driving force for opening and closing of the inlets throughout the years. In Succotash Marsh, an area along the southern coast of Rhode Island, the Army Corps of Engineers dredges the inlet to keep it open for the purposes of navigation. In the case of southern Rhode Island, the beach on a barrier island is responsible for protecting the salt marsh on its landward side because salt marshes require a much lower energy and sheltered environment to form. Salt marshes behind the beaches grow in low-lying areas. Sediment within the marsh consists both of a mix of sediment that is transported into the marsh such as silts and sands and organic material produced in place by the marsh through. Sediment in the marsh can also come from dunes on the beach. When a large storm creates enough wave or surge energy, it can pick the sediment off the dune and deposit it inland into the salt marsh, thereby adding material and raising it. This process helps the salt marsh rise and evolve to naturally survive against rising water and storms, but the layered sand-organic rich sediment layers also serve as an indicator of large storms. Succotash Marsh: Can our class replicate findings of a published study? A core from the group that went further landward to the marsh showing the different layers. Photo by Omar Fahmy. Theoretically, by putting this information together, we would be able to observe different layers of sediment consisting of organic material, peat, sand, and clay. If a sand layer is found in a sediment core, it could have been deposited by a storm. Combined with radiocarbon dating, we can match the data with historical storm records and determine impacts of past coastal storms. A team from Brown University did just that. The team was one of the first groups to study Succotash Marsh and was led by Jeff Donnelly. By digging cores through the salt marsh and carbon dating them, the researchers concluded that there was a significant storm surge of more than three meters in 1954, 1938, 1815, 1638 and 1635. Some these findings line up with the historical records we have for the Hurricane of 1938 and Hurricane Carol in 1954. To try and replicate the results of Donnelly and his team our class went out and dug some cores using the Troels-Smith method close to the beach and further inland, towards the marsh. Troels-Smith was a Danish scientist who developed a scientific scheme to classify different soils based on their appearance, composition, and texture. After pulling the cores we observed the different features of the layers such as color, texture, and composition. The group working near the beach found modern peat with some plant roots in the top 11 centimeters. Below this layer, there was a chunk of fine, clean sand that was 17 centimeters thick. This sand layer may have been deposited by the 1938 storm event! Interestingly, the group that collected cores from further inland in the marsh had a much thicker layer of sand closer to the top of the core and a much thinner layer of sand towards the upper middle. in contrast, the group that was closer to the beach had a thick layer of sand in the upper part and the upper middle of the core This confirms the findings of Donnelly and his team: the Hurricane of 1954 did not push sand as far inland into the marsh as the Hurricane of 1938 since the top deposit was likely the 1954 Hurricane and the upper middle deposit was likely the 1938 Hurricane. So next time you are at a salt marsh, remember that the soil under you holds answers to the past. By carbon dating this sand and observing its thickness, we can determine how long ago a storm occurred. The fact that storms push sand inland, which in turn raises the marsh shows the resilience of nature. The salt marshes do not only act as buffers for storms but are also naturally rising through sediment deposition to attempt to keep pace with rising seas. Unfortunately, at our current level of climate change, salt marshes are unlikely to be able to keep up with the rising sea level. Can you imagine what a future salt marsh-less world would look like? Omar Fahmy is a Masters of Environmental Science Management Student at the University of Rhode Island. Omar is also a professional stone mason. When not working Omar enjoys surfing and spending time with his family and friends on the southern coast of Rhode Island. Jeeban Panthi is a Ph.D. student at the University of Rhode Island and is pursuing his research on saltwater and groundwater interaction in Southern Rhode Island. Like water flows from mountain to ocean, Jeeban worked a few years in the mountain region (Nepal) and then came to Rhode Island for his study. He has had a few opportunities to go on glacier expeditions and white water rafting in rapidly flowing rivers. In his free time, he loves visiting new places, hiking, gardening, and reading and reviewing journal papers. Zane Grissett is in the final year of his undergraduate degree (B.S. Geology & Geological Oceanography) at the University of Rhode Island. He is currently studying the environmental effects of a 9-million-year-old meteorite impact in Argentina, but when he has some free time, you can usually find him surfing or spearfishing somewhere along the coast of Rhode Island. Feature Image: Reconstruction of the Laurentide Ice Sheet in southern New England: 26,000 years before present. Map by Bryan Oakley. ← How can we help salt marshes recover after an oil spill?